A reminder of what the bra looked like. If you have been following the 'Creating SS15 collection' then this is one of the collection pieces being made. We have gone from mood boards, sketches, working drawings and patterns, Now the pieces of fabric have been cut and sewn. I have sewn the brief on a standard sewing machine - just because it's what most people will have to start out. All the components and fabric cut ready to go. The legs and waist will have fold over elastic, which is as it sounds, elastic that fold over the front of the fabric and back, it's great for creating a clean finish. Also as I am only using a sewing machine and not an overlocker, I have to think about the internal seams. Traditionally french seams are used on delicate fabric to enclose your raw edge. If you are planning to use a french seam remember to add the seam allowance into the pattern. As I am wanting to create a control brief look, I'm going to make the seams a detail, so have bias cut binding in which I am going to enclose the seam, then turn to the side and sew down so it looks like the seam has been taped. To begin with I always create the front panel, if you always follow a structure of your sewing it's easier to keep track if you have many pieces. Once the side seams are attached, next the gusset is sewn on. If you're making your briefs on a domestic sewing machine only and no overlocker, then have the gusset in two pieces the outer gusset which is part of the front and the inner gusset which is the gusset part, this means that you can hide, both the front and back seam. Shown in the picture, the top layer of fabric is the front of the brief, the second layer is the back of the brief, and the bottom is the gusset. To create the hidden gusset seam, you need to twist the inner gusset and sew to the back gusset, so when straightened the gusset lies flat and seam is hidden. Next sew the back side seams like the front and then the whole brief is complete. I usually sew the full brief first then apply the elastics and over lap the ends and then sew down the overlap of the elastic to secure. The elastic to the legs and waist are attached by x/stitch, starting at the back seam. See finished brief below. Having sketched out the pattern freehand, there are usually alterations to make after the first toile. What i would change for the next fit and toile, would be lighter elastic, the elastic was too strong for the legs, you can see this on the back brief picture just up from the gusset, as they are not lying completely flat. Also because the elastic is quite heavy you can see the join. Having tried them on, I would take 3 cm off the back side panel and add it to the back centre panel. This will allow for a better stretch around the body, and will have better hanger appeal, as the front seam will then be in line with the back seam. Taking the design from the trend influence, a high waisted panel brief, I drafted out a rough pattern. I always start with the front then move onto the back patterns. Writing roughly the information on the pattern. 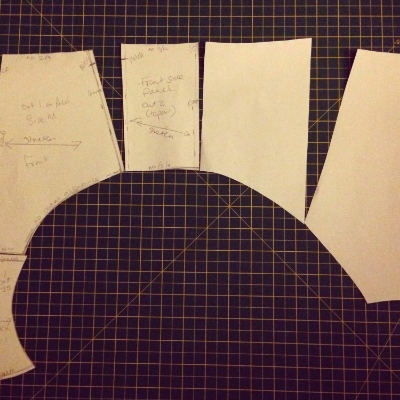 Information such as how many to cut, the stretch, the piece of the pattern, seam allowance and notches. Even though in many cases the information is the same from pattern to pattern, often you come back to them and can wonder what you were thinking so it's best to write, even roughly, all the information. By putting the centre back and centre front straight, you can see the natural curve of the leg and dart shapes that are at the waist. The pattern was drafted out then seam allowance added, then each piece was lain with the seam allowance over lapping to ensure the curves and lengths of the seams were correct. To make a pattern from scratch, ensure that the front pattern and back measure across the waist the same, so once the brief is made up the side seam sits on the side and doesn't pull to the front or back. You can see on my back pattern at the side that i've had to add to the see as it fell short of the front. Also when I put the side back panel to the back main panel, you can see that the back leg needed to be filled in. Lying the pattern flat, you can see the natural curve of the waist. By looking at the pattern both ways you can see just by looking at it if there are any glaring problems before you cut any fabrics out.